Cooking with Lu: A little intro to who I am and what I am doing here! A little intro to who I am and what I am doing here! Hi and welcome to my blog, more specifically to my first post! 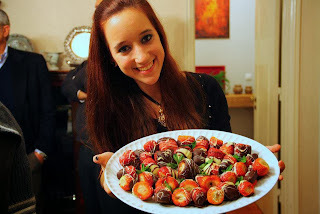 My name is Luísa Fonseca and I am the writer behind Cooking with Lu. I am a 21 year old musician and cooking & fitness enthusiast who lives in Lisbon, Portugal (in a tini tiny corner of Europe). I always cooked every now and then not very seriously and not following recipes nor anything, but recently started taking cooking more "seriously" (if that is even possible!). I like making all kinds of dishes & deserts and I always try to make them a little healthier then they are because I do care about what I eat and about my fitness. I am completely new to blogging and have actually no idea of how this works and of what to do, but will do my best to catch up quickly!